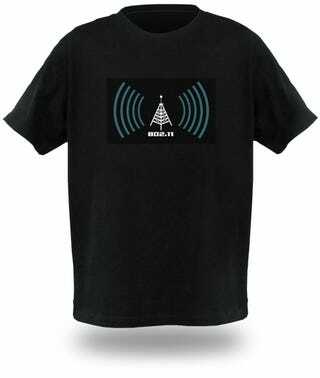 The Wi-Fi Detector shirt does everything you'd dream it could do: detect Wi-Fi signals and share them, via your chest, with the entire world. Spotting both 802.11b and 802.11g networks, signal strength is displayed in real time (big animated gif post-jump). After you are done broadcasting your (super ability?) to the world, just slip the AAA batteries out of the built-in pouch and unhook the decal, and you can wash the sweat away of a hard day's work of bandwidth theft.